Figure 35.4. sFLCs in different diseases compared with blood donors. Bars show range and mean concentrations of κ (red) and λ (blue) sFLCs. Juv chr arthritis: juvenile chronic arthritis; Juv FMS: juvenile fibromyalgia syndrome. Number of patients in brackets. (Courtesy of U. Hoffmann). Many rheumatic diseases feature polyclonal B-cell activation, high concentrations of autoimmune antibodies and polyclonal elevations of serum immunoglobulins. Earlier studies employing gel-diffusion and radio-immunoassay techniques have detected excess polyclonal FLCs in the serum and urine of patients with rheumatic diseases , hence it was speculated that their measurement might be useful for assessing disease activity. Hoffman et al. investigated the relationship between sFLCs and other markers of disease activity in patients with a number of rheumatic diseases. Patients with concurrent illnesses were excluded from the analysis to ensure that the changes were due exclusively to the disease under study. High polyclonal sFLC concentrations were found in rheumatoid arthritis (RA), systemic lupus erythematosus (SLE), Sjögren's syndrome, vasculitis and systemic sclerosis (SSc) when compared with control groups (28 patients with fibromyalgia and 19 blood donors; p<0.05) (Figure 35.4). 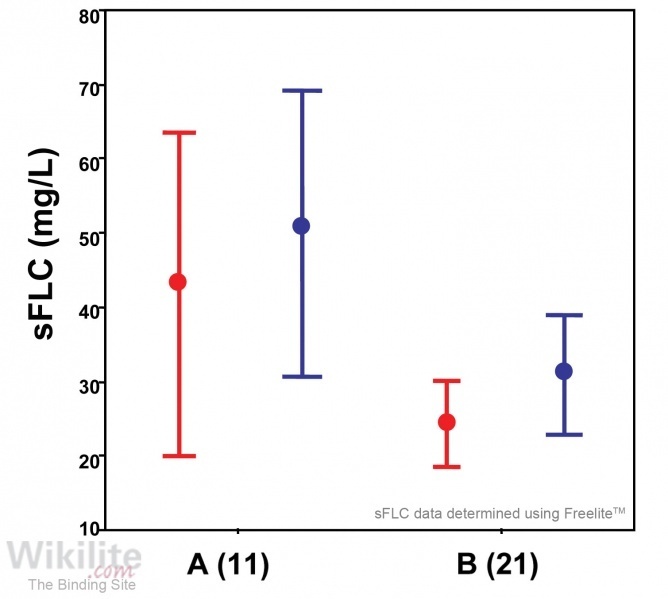 sFLC concentrations were more frequently elevated than intact immunoglobulins. As might be expected, there was a positive correlation between concentrations of sFLCs and serum creatinine in all patient groups. A preliminary study analysing sera from patients with different forms of vasculitis revealed similar ΣFLC elevations . The production of FLCs in certain rheumatic disorders has been studied in more detail, and the relevant publications are discussed below. Figure 35.5. sFLCs in SLE (A) with and (B) without renal involvement. Number of patients in brackets. Bars show range and mean concentrations of κ (red) and λ (blue) sFLCs. (Courtesy of U. Hoffmann). Hoffman et al. studied 45 patients with SLE and showed that sFLC concentrations were approximately 3-fold greater than normal (Figure 35.4). Predictably, sFLC concentrations were higher in SLE patients with renal involvement than in those with normal renal function (Figure 35.5). 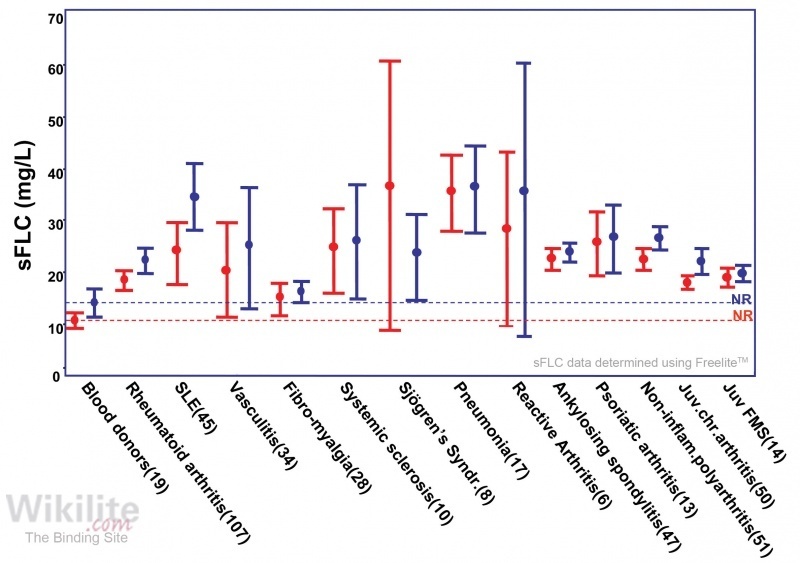 Clinical scores of SLE correlated with sFLC levels, particularly when the disease was active. In a subsequent prospective study, the clinical scores (European Consensus Lupus Activity Measurement, ECLAM ) in eight patients were compared with a variety of laboratory parameters . sFLC concentrations showed a strong correlation with disease activity that was not observed for CRP or erythrocyte sedimentation rate (ESR). A larger study with 75 SLE patients  also showed a strong association between ΣFLC concentrations and disease activity (as measured by the SLE Disease Activity Index, SLEDAI; p<0.001). Similar findings were reported by Garcia de Veas Silva et al. . The association of ΣFLC with disease activity was further corroborated in a study that employed a third disease activity scoring system (British Isles Lupus Assessment Group index, BILAG) . Assessment of autoantibody production is included (directly or indirectly) in SLE disease scoring systems and ΣFLC have, unsurprisingly, been found to be higher in anti-DNA positive versus anti-DNA negative patients (n=62) . These findings were confirmed by Garcia de Veas Silva et al. . However, in a group of 11 patients , falling concentrations of FLCs were monitored after B-cell depletion with rituximab and showed a significant correlation with total IgG but not with anti-DNA titres. In addition to renal function, a further complicating factor when interpreting sFLC concentrations in SLE patients is the potential influence of immunosuppressant treatments. In a cross-sectional study of 77 SLE patients, Jolly et al. found that the correlation of sFLC concentrations with disease activity (Physicians Global Assessment [PGA] and SLEDAI scoring) was stronger after controlling for steroid use. The authors concluded that sFLC measurement was potentially superior to anti-DNA antibody or IL-6 for disease monitoring. Figure 35.6. κ sFLC concentrations (and mean values) in patients with primary Sjögren's syndrome (pSS), rheumatoid arthritis (RA) and healthy controls. The line at 19.4mg/L &kappa sFLC indicates the upper end of the normal range. (Reproduced from  with permission from BMJ Publishing Group Ltd. © 2007). Figure 35.7. sFLC concentrations in relation to the presence of SSA and SSB antibodies in patients with Sjögren's syndrome. Gottenberg et al. evaluated sFLC measurements in 139 patients with primary Sjögren’s syndrome (pSS), an autoimmune condition that typically affects lacrimal and salivary exocrine glands. A total of 22% of patients had raised sFLC concentrations, and mean levels were significantly higher than controls (p<0.001) (Figure 35.6.). A number of other studies have also shown elevation of sFLC concentrations in primary Sjögren’s syndrome . In the study by Gottenberg et al. , sFLC concentrations were significantly correlated with IgG (p<0.001), rheumatoid factor (p<0.005), β2-microglobulin (p<0.001) and B-cell activating factor (BAFF, p<0.01). Association of elevated sFLCs with β2-microglobulin, gammaglobulin and lymphopenia was also reported for a mixed group of 22 patients with primary or secondary Sjögren’s syndrome . Gottenberg  also reported that mean sFLC concentrations were higher in patients with autoantibodies, particularly when both anti-SSA and anti-SSB antibodies were present (Figure 35.7). In addition, patients with extra-glandular involvement had higher levels of sFLCs than those with glandular involvement alone. These results suggest that extra-glandular involvement in pSS is associated with more intense stimulation of B-cells. A number of studies have investigated the correlation of sFLCs and other markers of B-cell activity with disease activity (as assessed by the EULAR Sjögren’s Syndrome Disease Activity Index, ESSDAI) . sFLC levels were associated with ESSDAI score in all four studies, and James et al. found that sFLC levels were associated with the cutaneous, biological and renal domains of the ESSDAI in particular. pSS is associated with an increased risk of non-Hodgkin lymphoma (particularly mucosa-associated lymphoid tissue (MALT) lymphoma) with an odds ratio of 12.9 . In a cohort of 395 patients enrolled into a 5-year prospective study (the ASSESS biobank), Gottenberg et al. sought to discover whether sFLC measurements could identify pSS patients at increased risk of lymphoma. At enrolment, a total of 16/395 patients had a history of lymphoma; median serum concentrations of BAFF and β2-microglobulin were significantly higher in these patients but sFLC concentrations and ratios were normal. This finding was confirmed in their later publication . In a different study , an abnormal κ/λ sFLC ratio was found in 11% (5/45) pSS patients at diagnosis, but 50% (6/12) of patients with established salivary gland MALT lymphoma without recent B-cell depletion therapy. Therefore, an abnormal κ/λ sFLC ratio was proposed as a potential biomarker of MALT lymphoma. There has been increasing interest in the role of BAFF as a marker of disease activity and as a potential therapeutic target in pSS. In a phase 2 trial of belimumab (a monoclonal antibody against BAFF), in which sFLC measurements were included as part of the haematological assessment, significant reductions in sFLC concentrations were observed following treatment . Figure 35.8. 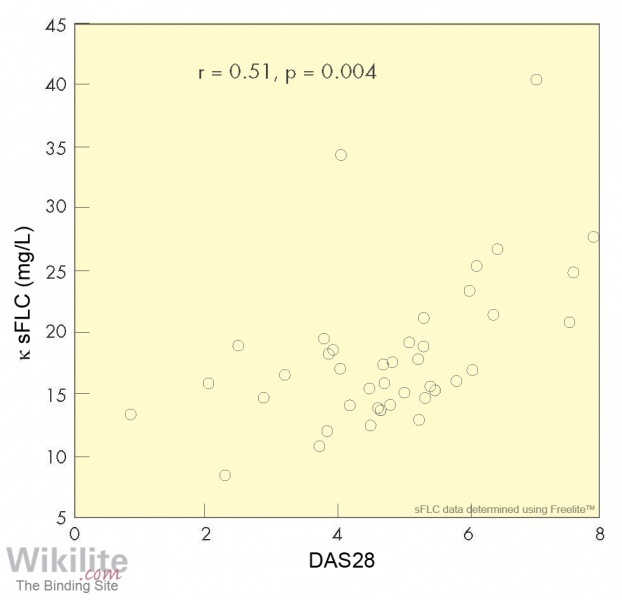 Correlation between κ sFLC concentrations and Disease Activity Score 28 (DAS28) in patients with RA. (Reproduced from , with permission from BMJ Publishing Group Ltd. © 2007). Figure 35.9. ΣFLC concentrations prior to clinical onset of RA and during follow-up. Gottenberg et al. studied 50 patients with RA: 36% had raised sFLCs with mean values significantly higher than controls (p<0.001) (Figure 35.6), while κ/λ sFLC ratios were normal in all but three patients. sFLC concentrations were significantly correlated with IgG (p≤0.04), CRP (p≤0.04), and rheumatoid factor (for κ only; p=0.03), but not with anti-cyclic citrullinated peptide (CCP) antibodies. Significant correlations were observed between disease activity assessed by the Disease Activity Score 28 (DAS28) and both κ (p=0.0004; Figure 35.8) and λ sFLC concentrations (p=0.05; data not shown). 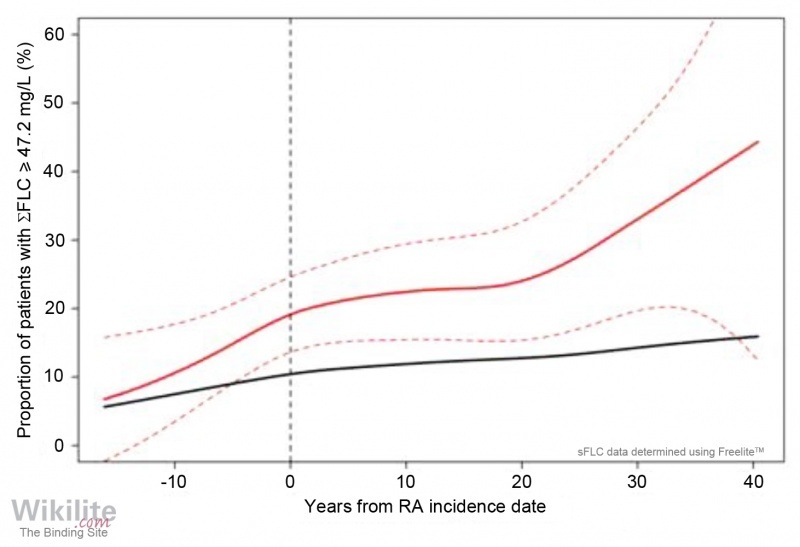 Other studies by Ye , Djidjik  and Garcia de Veas Silva  have also identified a correlation between sFLC elevations and disease activity in RA. sFLC concentrations as determined by ELISA were greater in RA patients and correlated with disease activity, whilst the FLC concentrations in synovial fluid were increased, suggesting local production . Further indication of local production was provided by synovial tissue cells staining positively for FLC and CD138 (Syndecan 1; a plasma cell marker) and these findings support the functional relationship between B-cells and disease activity. Interestingly, no correlation was observed between DAS28 and IgG . This may be explained by the longer half-life of IgG (approximately 21 days) compared with sFLCs (2 to 6 hours, Section 35.5). The fast turnover of sFLCs might account for their observed correlation with disease activity. In a further study including 710 patients with arthritis, Gottenburg et al. found that polyclonal FLCs (and other markers of B-cell activation) were higher in early RA than in undifferentiated arthritis. The authors concluded that B-cell activation is an early pathogenic event in the disease. This was supported by data from the Mayo Clinic: A focused, further analysis of their general population cohort (Section 35.10) revealed increased ΣFLC concentrations in RA patients (n=270), which were not explained by any differences in eGFR, Deng et al. studied sFLC concentrations in 127 individuals prior to the onset of RA and showed that elevations in ΣFLC could be recognised 3 to 5 years before RA diagnosis (Figure 35.9). During follow-up, ΣFLC increased at a rate of approximately 1% per year until RA diagnosis, and 3% per year thereafter. The top decile of ΣFLC (>47.2 mg/L) was associated with an increased risk of mortality, although this was similar to that reported in the general population cohort (Section 35.10). In addition to the studies investigating correlations between sFLCs and disease activity, others have assessed the utility of sFLC measurements in assessing response to treatment in RA. Kormelink et al. measured sFLC concentrations at 3 and 6 months following treatment with rituximab (for depletion of CD20-positive cells) and found that they were reduced more significantly in clinical responders than in non-responders, and did not correlate well with intact immunoglobulin measurements. Sellam et al. compared baseline concentrations of various markers in 208 RA patients and found that elevated IgG, presence of rheumatoid factor or anti-CCP antibodies were predictive of response to rituximab, whereas sFLC concentrations were not. Unfortunately, the changes in serum markers in response to treatment were not recorded. A further study of rituximab treatment in 28 RA patients indicated that monitoring changes in sFLC concentrations (and other serum markers) was the most informative way of assessing response to treatment and identifying relapse . 29. Dispenzieri A, Katzmann JA, Kyle RA, Larson DR, Therneau TM, Colby CL et al. Use of nonclonal serum immunoglobulin free light chains to predict overall survival in the general population. Mayo Clin Proc 2012;87:517-23.